I'm surprised how clear it is. Yes, the "Sweat" is a type of name for the brand they're selling. The original drink is called "Pocari Sweat", which has the same mix of substances and fluids as human sweat. In other words, it's a sports drink, and it's actually really tasty. :) Therefore I believe Pet Sweat would be the equivalent for animals. 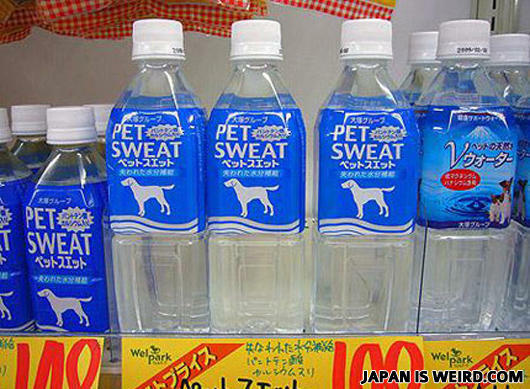 Pet Sweat is suitable for your pets. Purified using our own makeshift PUR® water filters. I think that's just what they call it... I mean maybe it's just water specially made for animals....right...? Every bottle is a surprise! Pet branch of Pocari Sweat (JUST A NAME... and Pocari doesn't even mean anything, it just sounds light and refreshing), which is actually a pretty yummy sports drink. Seriously, Domestical Animal Sweat drink? Why was the muslim surprised? A tyrannosaurus rex bit off his legs. Husband: Honey, I heard that when you die, you come back as a different creature!